The Guy pointed out that it looks fun, but he hasn’t had girls giving him bad pickup lines recently. Because we met in church, I’ve combed through several websites of Christian pickup lines (aka 21st century evangelical lines), and added links to Wikipedia to explain the cultural references. These lines work for either gender, so you Christian ladies can now use terrible puns to chat up the guys. Is it hot in here or is it just the Holy Spirit burning inside of you? Your spiritual gift is your good looks. . . it lifts people’s spirits! I went on a mission trip but all I ended up doing was mission you. I used to believe in natural theology, but since I met you, I believe in divine revelation! You put the “stud” in bible study. You must be made out of water, because Jesus turned you into fiine. Is that a mirror in your Bible? Because I see you reflecting Christ! I heard Jesus called you. . . mind if I do the same ? Is that a Travel Bible in your pocket, or are you just happy to see me? If I kissed you on one cheek, would you turn the other? I know the Way, the Truth, the Life. . . and a nice restaurant we can go to! Proverbs says that whoever gives an honest answer kisses the lips. Feel free to shower me with honesty! If Eve was tempted by an apple, then you must be my fruit. 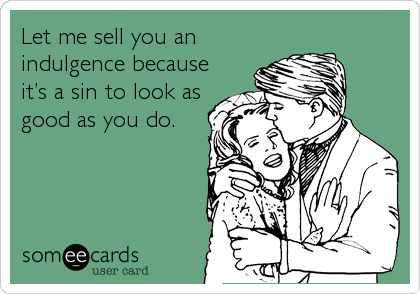 Baby, you are the evidence of intelligent design. Are you related to Abraham’s nephew? Because I like you a LOT. I like my guys like I like my Microsoft Word documents. . . saved. 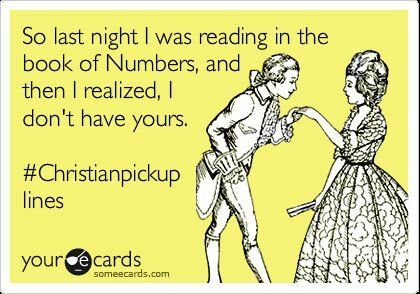 The books of the bible are Genesis, Exodus, Leviticus, Numbers, and Deu-you-want to go out with me? I guard my heart. And you just set off my security alarm. Some of those are hilarious, Celia! !